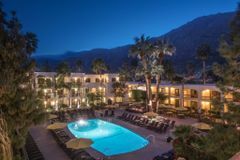 Palm Springs is one of the most popular golf holiday destinations anywhere in the USA and for luxury, impeccable service, spa facilities and, of course, championship golf the Palm Mountain Resort & Spa is a fantastic accommodation option. The resort boasts fantastic guest rooms, an outdoor pool and a lavish spa which is the perfect place to escape to after a long day on the fairways. Its excellent location also offers guests easy access to a nearby health and fitness center as well as downtown Palm Springs and the neighboring desert landscape. Spacious guestrooms are available in a range of classes and sizes and all feature designer furniture and modern amenities that will ensure your total comfort. Large bay windows also allow guests to gaze out over the surrounding desert mountains. The resort’s great location also gives guests the chance to sample the culinary delights of Palm Springs. Dine under the stars in the middle of a colorful courtyard filled with mariachi music or in a romantic hideaway bistro just down the street or on a patio surrounded by fireplaces. Whatever the occasion or mood, Palm Springs offers a variety of dining options to satisfy everyone’s palette. The hotel's palm tree-lined pool terrace is the resort's focal point and this oasis of sun, fun and color has it all including comfortable sun loungers, and a lavish spa where guests can treat themselves to relaxing treatments and massages.